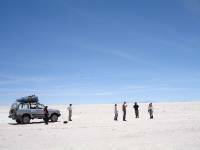 Blog from Uyuni, Bolivia | Margaret in Wonderlands..
We arrived in Uyuni at 6am and we were wrecked, sheer exhausted so we headed for a hostel got a room and passed out for several hours. When we woke it was a beautiful day so we went for some lunch and stroll. There are tons of pizzaries in this town and they do impress. Aimee and I shared one and it was DELICIOUS. We then went for a walk to check out the town and find out about the tours. We knew we wanted to do a 3 day one and we wanted an English speaking guide so we opted to pay the extra and got booked on the tour for the next day. As 700 Bolivianoes this was only about 62 quid for a 3 day tour including all food and 2 nights accomodation so its a real bargain. We then went for a light supper and picked up some water and snacks for the road trip the next day. The next day we headed for our 3 day tour. When we got to the office it was a gorgeous day and we sat outside. We soon found out that we could not have an English tour guide as he was sick. This was rather annoying as we did prefer English speaking. I can understand a bit but Aimee can not speak or understand a word of Spanish. It also meant we were paying a little extra then we should be with this company but hey thats the way it goes. We were soon put in a group with Tom from Holland, Ed from England, Alex from Brazil and Artur from Israel. There are a lot of Israels and Americans in South America. We soon set off on our tour and the first stop was the train cemetrey-Cementerio de Trenes. There were trains abandoned there for over 75 years. They were pretty cool all rusty and in the middle of the dessert. We took some pictures and climbed on them. The next stop was Colchani which was a little town where Aimee and I bought some scarves. They sold lots of different salt fixtures e.g. shot glasses little pots etc. We had our lunch there and it was Llama with quinola, tomatoes, avocadoes and cucumber. Followed by a bannana for dessert. After lunch which was Llama meat, salad and quilnola we made our way to the Salt Lakes. There was a little dog hanging around at lunch so we gave him some left over llama meat. Well this little dog took forever to chew through the meat.. clearly he was struggling like we had been but it was really funny to watch as he seemed to chew forever. As rainy season has just finished there was still a lot of water on the lakes so we made our way in the jeep across water which must have been a good few cm high. It takes a while for the water to evaporate. After touring for a while across this 3,000 square metres salt flat with a beautiful blue sky and mountains and volcanoes in the background we eventually hit the salt hotel. This was a building purely made of.. you guessed it.. salt! We took some funny pictures in the landscape and I was even roped into taking part in a human Hebrew message which said 'happy holidays'. I do not think the pictures will do it any justice but it was spectacular. After we finished up at the salt flats we then headed back briefly to Uyuni before heading on a few hours drive to San Juan. We ended up in San Juan just around 6.30 and was there in time for a beautiful red sunset. Our hostel was an AMAZING salt hotel, there was salt on the ground and the chairs, tables and even bed bases were made of salt. Unreal and brilliant. We had a soup dinner followed by a chicken and chips which we all throughly enjoyed! The next day and a 7am start we headed across some amazing landscape. I cannot describe how beautiful it was, it looked like a painting. It did not look real, there were a mix of different colour mountains and the way the sun hit it was beautiful. There would be some dark shading on the mountain so it looked like charcoal. No words can really describe what we saw but they really did take our breath away. We saw some dry salt flats which were gorgeous. We went to cross a train line and the guide made us get out of the car before he tried to get across it. Driving a 4x4 Lexus it was obvious it was going to get across it perfectly fine. We stopped for lunch at the Laguna Celeste which was a beautiful blue, green lake. We then passed Laguna Canapa, Laguna Hedionda which had pariguanas which are basically flemingoes.We then went past Laguna Chiarkota and Honda. We saw some Vicunas which looked like deers. We also saw some pariguanas which are basically flemingoes. We visited the Arbol de Pedra which was a stone tree. We did some climbing up on the rocks and took some more pictures. Our next stop was the Laguna Colorado which is a massive red laguna. It is the colour because of the algee in the water. To look at it was amazing as I have never seen anything like it. We then paid our 150bolivianoes and went to the little little town beside it. After a cup of tea Aimee and I headed off for a walk around the tiny town. It was getting really cold so we headed back. Well we were 4,270m above sea level. For dinner we had a lovely soup and then spaghetti and some sauce and cheese with a glass of red vino. It was a good heartly meal after our busy day touring in the 4x4. Later on we headed to bed as we had a 4.45 wake up call the next morning. On our last day we woke and had a pancake breakfast and headed off on the next few stops. The first stop was the geysers the Sol de Manana of hot sulphur rising from the dessert. We then went to some hot springs which were amazing and were 30-35 degrees. They were called the Aguas Termales and the hot pool was overlooked by the stunning mountains and a gorgeous backdrop. After we went past the dessert de Salvador Dali which is named after a famous painter. The colours are nothing you can even imagine.. beautiful. We went past a massive volcano called the Volcan Licancabur which was 5,960m tall. It was a real mix of colours..reds, browns.. stunning. The landscape looks like pictures, like charcoal or something just gorgeous with lots of shading and different colours so it was beautiful to drive through it. After we headed to the Chile boarder to drop off Tom and Eddy. That left only Alex, Artur, Aimee and I in the car. It took 7 hours to head back to Uyuni and we did a few stops along the way at some gorgeous locations in the middle of the desert. Our driver told us there had been a fatal accident the day before and 3 Israels and the driver had died. It seemed this could happen quite often as the roads were seriously dangerous and some drivers drove really fast around these sharp bends. We stopped for some lunch which consisted of rice, tuna and salad with sweetcorn.. tasty! One stop was in San Cristobal which was the mining town and there was a lot of construction under way. Clearly they must be getting ready for tourism in the future. After returning to Uyuni we had some dinner with the guys and then caught the bus to Tupiza. It took about 5 hours and we arrived at 2 in the morning. There was a lot of women and kids on the bus. One woman beside us had 3 kids and one was a baby. I asked how old and she was 8 months and a right little chubber, she was eyeing Aimee up. When we looked over the baby was chewing on something and I said is that a chickenbone.. Aimee was like No, can't be.. low behold the 8 month old baby pulled out this drumstick with no meat on from its mouth... Sweet lord it was so bad but sooo funny at the same time. The women in front proceeded to put the crying baby on the floor in the asle which was pitch black.. honestly child protection agencies would have a field day with this.